Sevier County (pronounced "severe") is a county of the state of Tennessee, United States. Its population was 71,170 at the 2000 United States Census. It is included in the Sevierville, Tennessee, Micropolitan Statistical Area, which is included in the Knoxville-Sevierville-La Follette, TN Combined Statistical Area. The county seat is at Sevierville, the largest city in the county. Prior to the encroachment of white settlers in present day Sevier County in the mid-18th century, the area had been inhabited for as many as 20,000 years by nomadic and semi-nomadic Native Americans. In the mid-16th century, Spanish expeditions led by Hernando de Soto (1540) and Juan Pardo (1567) passed through what is now Sevier County, reporting that the region was part of the domain of Chiaha, a minor Muskogean chiefdom centered around a village located on a now-submerged island just upsteam from modern Douglas Dam. By the late 17th-century, however, the Cherokee— whose ancestors were living in the mountains at the time of the Spaniards' visit— had become the dominant tribe in the region. Although they used the region primarily as hunting grounds, the Chicakamauga faction of the Cherokee vehemently fought white settlement in their territory, frequently leading raids on households, even through the signing of various peace treaties, alternating short periods of peace with violent hostility,  until forcibly marched from their territory by the U.S. government on the "Trail of Tears". Sevier County as it is known today was formed on September 18, 1794 from part of neighboring Jefferson County, and has retained its original boundaries ever since. The county takes its name from John Sevier, governor of the failed State of Franklin and first governor of Tennessee, who played a prominent role during the early years of settlement in the region. 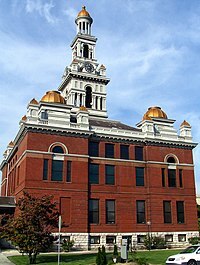 Since its establishment in 1795, the county seat has been situated at Sevierville (also named for Sevier), the eighth-oldest city in Tennessee. Prior to the late 1930s, Sevier County's population, economy, and society— which relied primarily on subsistence agriculture— held little significance vis-à-vis any other county in the rural South. However, with the creation of the Great Smoky Mountains National Park in the early 1930s, the destiny of Sevier County (within which lies thirty percent of the total area of the national park) changed drastically. Today, tourism supports the county's economy. The head of the Sevier County government, the county mayor, is elected in county-wide elections. The mayor serves along with a 25 member commission of elected officials representing the many small communities spread across the county. .
Larry Waters is the current county mayor. The county tends to go strongly Republican in Presidential elections. In 1916 it may have given Charles Hughes the highest percentage of any county in the nation. In 1932 Herbert Hoover reportedly received 77.01% of the vote and in 1936 Alf Landon received 77.73%. Since 1992 no Republican candidate has received less than 55% of the county's vote and in 2008 John McCain received 73.4%. From its beginnings as a traditional subsistence-based farming society, Sevier County has grown into a major tourist destination since the establishment of the Great Smoky Mountains National Park, which is dominates the southern portion of the county. One of the very reasons for the park's creation, however, was also one of the county's first major economic engines: the lumber industry. Establishments in what is now the national park felled large amounts of timber in the early 1900s. Though the park effectively killed the then-lagging industry in the late 1930s, it spurred the development of one of the largest tourist resorts in the United States of America, as the Great Smoky Mountains National Park is now the most visited national park in the country. In recent years the tourism bubble has expanded beyond the city of Gatlinburg, which borders the Northwestern segment of the national park, and into the nearby cities of Pigeon Forge and Sevierville. The commercial cabin rental industry has grown tremendously in recent years. Great Smoky Mountains National Park, southern Sevier County: Established in 1936 and propelling the tourism industry in Sevier County ever since, the national park is the most visited in the entire system, welcoming over 10 million nature enthusiasts every year, most of which arrive through Sevier County . Dollywood, Pigeon Forge: The theme park named for part-owner Dolly Parton (who was born in Sevierville) admits 2.2 million guests a year, making it both the most popular theme park and most frequented attraction (after the Great Smoky Mountains National Park) in Tennessee . Ripley's Aquarium of the Smokies, Gatlinburg: Opened in 2000 and designated the most visited aquarium in the United States in 2001, when over 2 million tourists passed through its galleries, Ripley's Aquarium of the Smokies is the largest single tourist draw in Gatlinburg . According to the U.S. Census Bureau, the county has a total area of 598 square miles (1,550 km2), of which 592 square miles (1,530 km2) is land and 5 square miles (13 km2) (0.91%) is water. As one of the largest counties in Tennessee, Sevier County's terrain varies from one of the most rugged portions of the Appalachian Mountains to the river valley of the French Broad River and Douglas Lake. The maximum elevation differential in Sevier County is the greatest in Tennessee, ranging from a high of 6,643 feet (2,025 m) at Clingmans Dome (the highest natural point in the state) to a low of 850 feet (259 m) at the French Broad River . As of the census of 2000, there were 71,170 people, 28,467 households, and 20,837 families residing in the county. The population density was 120 people per square mile (46/km²). There were 37,252 housing units at an average density of 63 per square mile (24/km²). The racial makeup of the county was 97.27% White, 0.56% Black or African American, 0.32% Native American, 0.55% Asian, 0.02% Pacific Islander, 0.42% from other races, and 0.85% from two or more races. 1.24% of the population were Hispanic or Latino of any race. There were 28,467 households out of which 30.70% had children under the age of 18 living with them, 59.30% were married couples living together, 10.10% had a female householder with no husband present, and 26.80% were non-families. 22.00% of all households were made up of individuals and 7.90% had someone living alone who was 65 years of age or older. The average household size was 2.48 and the average family size was 2.88. In the county, the population was spread out with 23.00% under the age of 18, 8.30% from 18 to 24, 29.80% from 25 to 44, 26.30% from 45 to 64, and 12.60% who were 65 years of age or older. The median age was 38 years. For every 100 females there were 95.90 males. For every 100 females age 18 and over, there were 92.20 males. The median income for a household in the county was $34,719, and the median income for a family was $40,474. Males had a median income of $27,139 versus $20,646 for females. The per capita income for the county was $18,064. About 8.20% of families and 10.70% of the population were below the poverty line, including 13.10% of those under age 18 and 10.10% of those age 65 or over. Sevier County was Tennessee's third fastest-growing county by percentage change in population between the 1990 census and 2000 census. The Sevier County School System is composed of thirty-two public and private institutions ranging from Head Start programs through a number of secondary schools. One post-secondary institution is also located within the county. The one post-secondary institution in the county is a satellite campus of the Morristown-based Walters State Community College. The massive development of the tourism industry in Sevier County in recent years, while blessing the county with good economic fortunes, has indeed put a major stress on the county's roadways. In effort to control this the county has put forth numerous projects to widen existing highways, and the cities of Pigeon Forge  and Gatlinburg  have also implemented a bus service oriented towards visitors, which ferries tourists to and from various popular destinations throughout the towns via decorated buses referred to as "trolleys." A combination of many of these highways linked together as they run from Tenneessee Exit 407 of Interstate-40 through the cities of Sevierville, Pigeon Forge, and Gatlinburg to the entrance of the Great Smoky Mountains National Park functions as the Great Smoky Mountains Parkway. Along this stretch of U.S. and Tennessee highways a major, nearly uninterrupted tourist center (separated only by a spur route of the Foothills Parkway, known as "the spur") has emerged in the three communities. Sevier County is the setting for the novel Child of God by Cormac McCarthy. Gatlinburg was the site of the showdown between Sue and his father in the Johnny Cash hit single A Boy Named Sue. Entertainer Dolly Parton was born and grew up in Sevierville, and many of her early songs drew on her experiences there, perhaps most notably "My Tennessee Mountain Home". 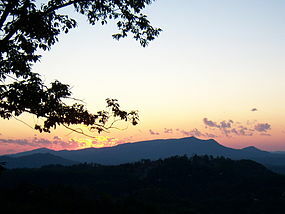 Sevier County, like much of rural Tennessee, consists relatively few incorporated municipalities and numerous unincorporated settlements. The cities of Gatlinburg, Pigeon Forge, Pittman Center, and Sevierville (the four incorporated cities) account for only a small portion of the total population of over 70,000 . This page uses content from the English language Wikipedia. The original content was at Sevier County, Tennessee. The list of authors can be seen in the page history. As with this Familypedia wiki, the content of Wikipedia is available under the Creative Commons License.